Turbomiser from Geoclima is the most efficient chiller of its type on the market today: thanks to the use of Turbocor compressors, it is able to reduce energy costs by up to 50% compared with traditional units that use screw or reciprocating compressors. Turbomiser chiller has won several awards, including CIBSE, the most prestigious award for technology with low environmental impact. In addition to ultra-efficient performance, Turbomiser improves comfort and productivity levels in buildings thanks to its innovative design and continuous monitoring. And, with its frictionless magnetic bearings, service and maintenance costs are significantly reduced. 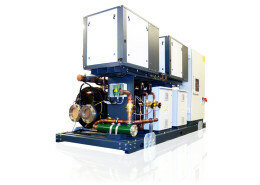 a sophisticated chiller control system which integrates with that of the on-board integral compressor control to optimise performance of the system as a whole. Outstanding energy efficiency reduces operating budgets and helps shrink a facility’s carbon footprint, thanks to annual energy usage 30% to 50% less than conventional screw or reciprocating compressors chillers. Exceptional Energy Efficiency Ratios (EER) and Seasonal Energy Efficiency Ratio (SEER) are assured. Refrigerant leaks are useless, costly and entirely avoidable. They are a consequence of poor design and/or maintenance of plant. The Turbomiser is designed to minimise or avoid leaks altogether, through reducing the number of components and joints in the system. As a result of the oil-free design and limited number of moving parts, the Turbomiser requires no oil changes and much reduced servicing to ensure efficiency and reliable running. The technology is highly reliable and proven to save the end user cost and reduce down time. The Turbomiser packs a lot of cooling power into a small space. Turbocor compressor weighs just 125 kg (275 lb) compared with 600 kg (1323 lb) for typical screw and reciprocating compressor chillers. 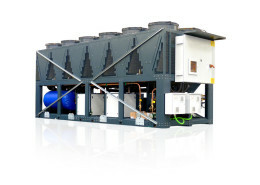 This frees up plant rooms, reduces loading on rooftops and enables chillers to be sited in spaces considered too tight for standard chiller technology. 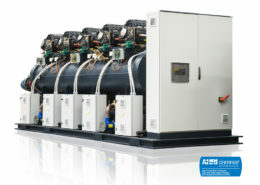 The use of a variable speed drive enables chiller output to be finely controlled between 15% to 100% of capacity, enabling cooling to be matched precisely to load. 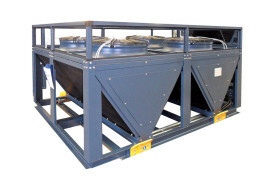 Given that Geoclima chillers operate at part load the bulk of the time, this helps significantly reduce energy consumption and ensure effective cooling. Noise is a growing issue, particularly with the introduction of air conditioning to buildings in built-up and residential areas. 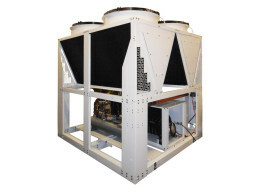 The Turbomiser addresses this through exceptionally quiet operation, down to 67dB at 5 metres. Due to its design, the Turbomiser chiller is also virtually vibration free: there is no need for anti-vibration mountings or special supports. Conventional chillers may require up to 600 Amperes starting current, putting a huge draw on a building’s electricity supply, and sometimes requiring an expensive upgrade of the substation. Turbocor compressors only need 5 Amps to start, saving costs and maintaining headroom for other essential services.